← Are All Hollow Trees Hazardous? This photo shows improper mulching. ?This tree has had mulch placed at the base of the tree since it was installed. ?The mulch was piled that way to help protect an improperly planted tree. One of the problems with mulch volcanoes is that bark is designed to be exposed to air. 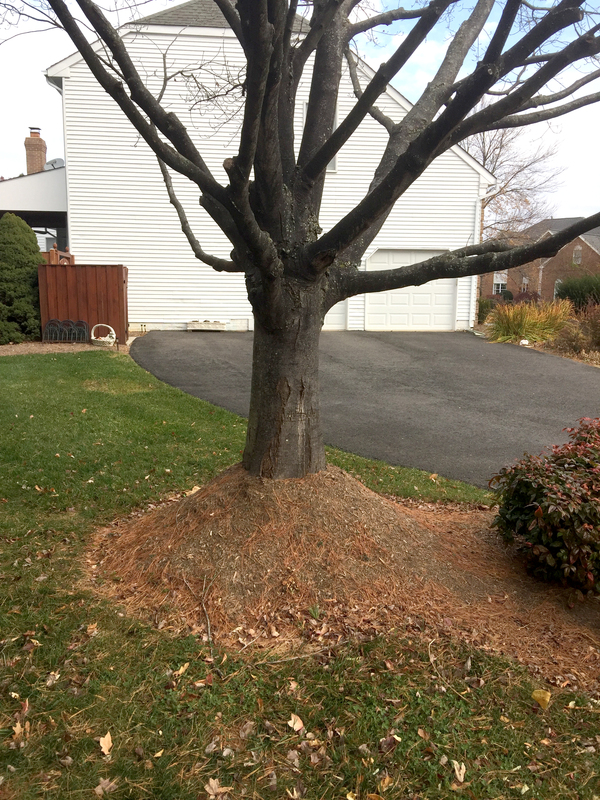 ?When it is covered with mulch, then the bark cannot dry properly and that is a great way for a disease and rot to attack the lower stem of a tree. ?Another problem of mulch volcanoes is that roots can grow inside the mulch. ?Since the roots are not in the soil where they would be properly insulated, they are more susceptible to drying out and dying, which can stress a tree. This tree was doomed from the start when it was not planted properly. ?Half of the root ball of this tree was planted above ground, which led to the mulch volcano trying to protect the exposed root system. ?Trees can survive planted this way, but they won’t thrive and it makes them more susceptible to problems down the road. ?With such a mature tree, these problems cannot be fixed. ?If your tree is recently planted, it can be fixed by replanting at proper levels and applying a thin layer of mulch. Be sure to watch your landscapers when they plant trees. ?Most professional landscapers plant at proper levels, but if the landscapers are not knowledgeable, you may be dealing with a tree that requires a lot more maintenance. 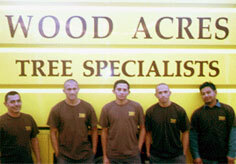 For expert advice about your trees contact the certified arborists at Wood Acres Tree Specialists. This entry was posted in Damage, Tree & Shrub Care, Trees & Shrubs, Wood Acres Tree Specialists and tagged tree advice Silver Spring MD, tree consultation Kensington MD, tree consultation MD, tree diseases Bethesda MD, tree problems DC, tree problems Gaithersburg MD, tree problems Potomac MD, tree problems Rockville MD. Bookmark the permalink.